Product prices and availability are accurate as of 2018-12-15 21:16:15 EST and are subject to change. Any price and availability information displayed on http://www.amazon.com/ at the time of purchase will apply to the purchase of this product. 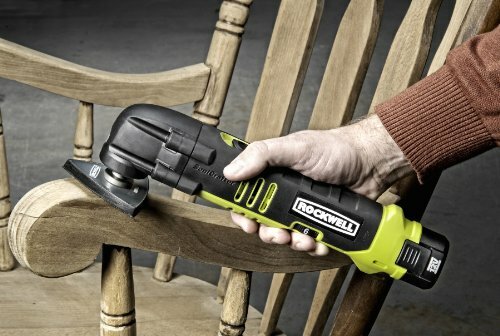 The Rockwell RK2522K2 Cordless Sonicrafter with Universal Fit System and (2) 12-Volt lithium batteries is the perfect go anywhere and do anything multi-tool. No more searching around or shopping for the proper brand blade. The Cordless Sonicrafter will allow other brand blades to fit securely without slippage on the Universal Fit System. The RK2522K2 Cordless Sonicrafter also has variable speed control which allows for precision cuts when tackling detailed jobs or even heavy duty tasks. Its effortless design, and flexibility as a multi-tool, will make it your go-to and go-anywhere tool on the jobsite or around the house. 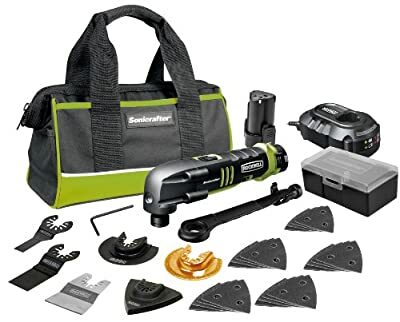 Whether you're a professional or an avid do-it-yourselfer, the all-in-one and versatile 30-piece Rockwell RK2522K2 Cordless Sonicrafter kit with Universal Fit System gives you the ability to sand, polish, scrape, and cut a wide variety of materials without a cord so it can go anywhere and tackle any job. With its two 12-Volt lithium batteries, there is no downtime. Lithium batteries can be charged anytime without memory effect, and hold their charge longer without draining or waning like a standard battery. The included quick charger, along with the 2 batteries, will assure there is no downtime waiting for a battery to charge. It is an effective tool to help streamline any job tasks. It's portable, cordless, and adaptable. The variable-speed operates with microsonic high-frequency oscillation to produce smooth, safe movements without kickback. It will be your go-to-tool for all your projects like scraping to remove paint, old caulking, rust, stain, polish, or grout. Use it to score ceramic tile, remove and cut carpeting, or sand and polish those hard-to-reach spaces. Easily switch blades to cut wood, thin metals, fiberglass, masonry, plastic, flooring, cement board, and even vinyl siding. 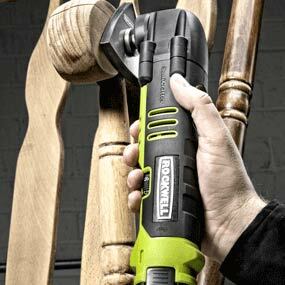 It would take various other tools to do what the all-in-one Rockwell RK2522K2 Cordless Sonicrafter can do in less time, less effort, and less hassle. The Sonicrafter's slim body allows you to work in areas that are not often accessible with other tools (view larger). Rockwell's Universal Fit system allows you to easily and securely switch between accessories of most brands for use with the Sonicrafter (view larger). Rockwell’s RK2522K2 30-piece Sonicrafter oscillating tool kit is equipped with everything you need to tackle a variety of projects, whether you’re a professional contractor or an avid DIYer. At the center of this kit is the all-in-one 12-volt Sonicrafter, which—thanks to the collection of blades, sanding pads, and other included accessories—is ideal for scraping, scoring, sawing, sanding, polishing, and cutting jobs big and small. 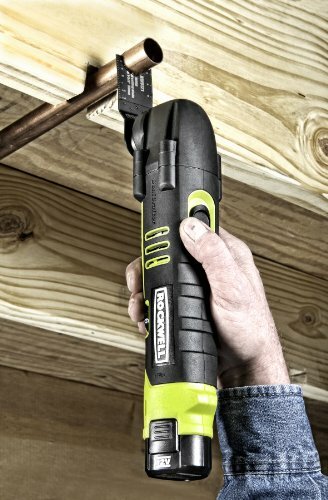 Powered by lithium-ion battery technology, this Sonicrafter delivers the ultimate in efficient cordless productivity. 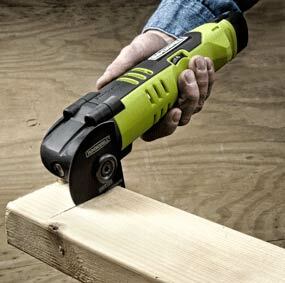 Not only does the RK2522K2 kit include the 12-volt Sonicrafter, it also contains two lithium-ion batteries and a 30-minute charger to ensure you’re never out of premium cordless power while working on the job at hand. Lithium-ion batteries hold their charges longer than their traditional counterparts, and when they do need to be charged they can do so without memory effect. Not only is the Sonicrafter portable, cordless, and adaptable, it’s also comfortable to use. It features a slim body for extended use that is also ideal for use in tight spaces. Its variable-speed capabilities allow for microsonic, high-frequency oscillation to create smooth and safe movements without any kickback. Applications are as diverse as scraping paint or wallpaper, polishing metal, sanding wood, scoring ceramic tile, or cutting carpeting. Rockwell’s proprietary Universal Fit system eliminates the hassle of searching or shopping around for the proper brand blade to fit the Sonicrafter. It accepts accessories from other brands, attaching quickly and securely so that you can continue your job with minimal downtime. Easily switch between a variety of blades from most brands to cut wood, masonry materials, flooring, plastic, fiberglass, cement board, thin metals, or even vinyl siding. One Rockwell RK2522K2 cordless Sonicrafter with Universal Fit system, one 1-3/8-inch bi-metal end cut blade, one 3/8-inch bi-metal end cut blade, one 3-1/8-inch HSS semicircle saw blade, one rigid scraper blade, one sanding pad, 20 sanding sheets, one carbide semicircle grout blade, one dust extractor, two 12-volt lithium-tech batteries, one 30-minute charger, one Allen key, and one carry bag.